I would like to introduce you to Hoggle the hedgehog. We took in this little guy on Friday night. 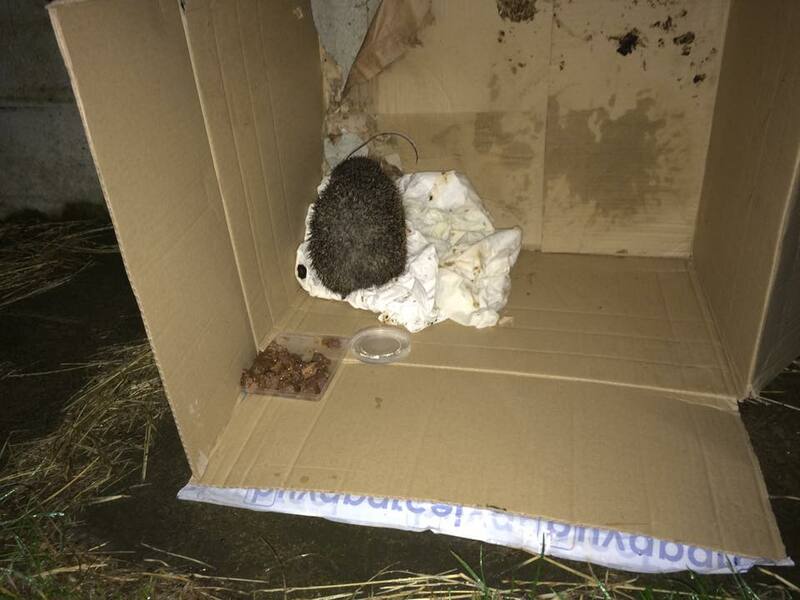 He was curled up in a ball at the side of the road and we nearly ran him over, so we turned round and picked him up. He was very lethargic and the rescue centre said he may be in shock after being clipped by a car. We popped him in this box in our bath with a hot water bottle, an old shirt, and a bit of wet dog food and water. He started eating and moving around a bit on Saturday. He’d started trying to make his escape early Sunday morning (as you can see by the big holes in the box), so I think that it was his way of saying that he was definitely ready to be released. I took this photo just after I’d put his box outside. By the time I got back to the box with his water and food, he’d moved straight back onto his shirt after I tipped the box over. He must be comfy on it. I checked on him before went to bed and he’d gone on his merry way. It was lovely to have Hoggle stay with us, but he was a little stinky bum. Here’s wishing him good luck on his travels.